A slight trick of the mind makes for a great experience in the cinema. Last year, the Baker Street Babes interviewed Mitch Cullin, author of the recently-published novel A Slight Trick of the Mind, still one of the most unusual Sherlock Holmes novels in existence. We enjoyed the novel and Cullin’s company, so we were thrilled when the film version of the book was announced (with a probably-wise title change to make the subject clear to filmgoers). I don’t live in a huge city, so my cinemas only just got the film, and to my delight, I finally had a chance to see it. I’ve thought a lot about how to approach this review because Mr. Holmes is not a traditional Holmes film, and it doesn’t tell a traditional Holmes story. It’s nothing like The Private Life of Sherlock Holmes, but it has an equally vast amount of contrast with everything that’s come before it in the Holmesian world. I think I’ll just dive in with my favorite thing about the story: Mr. Holmes is for people who live with Sherlock Holmes on a daily basis. Films like Guy Ritchie’s versions or TV’s Sherlock and Elementary may be nontraditional in some ways, but they’re all written and produced with casual viewers in mind. Each one, in its way, periodically reintroduces the viewer to exactly who this Holmes chap is and what he’s supposed to be good at doing. Mr. Holmes is, I would argue, not really for the casual viewer. It’s for the person who has lived with and loved Holmes long enough that he’s become not just a guy we’ve heard about once, but a part of our lives, an archetype within our imaginations who helps us understand the world and ourselves, a figure who, to us, goes beyond one traditional story format. I can’t imagine Mr. Holmes being made even ten years ago, and if someone had chanced it, I highly doubt it would have been successful. But the world has changed, and many of us have embraced Holmes and interpreted him and re-interpreted him over and over for our times. I am thankful to Mitch Cullin, Sir Ian McKellen, BBC Films, and Miramax for realizing that Holmes no longer has to stay in a box where he puts on a deerstalker, peers through glass, and solves a case (not to say that I don’t enjoy traditional stories and adaptations–they’re great). Writers have known this for a long time, but finally, someone dared to depict something new for us on screen. The Sherlock we meet in Mr. Holmes is 93, retired, and preparing, quite obviously, for the end of his life. The myth of who he is has grown up around him, to the point that he can go to the cinema and see films about himself. The contrast of legend with reality serves to humanize the man Sir Ian portrays with such compassion and understanding. I said above that the film isn’t a traditional mystery, but it does contain cases–three, to be exact. Perhaps it sounds strange to say that a film with three entire mysteries in it isn’t about mystery at all, but believe me, it’s true. Or, rather, the real mystery that weaves through all the others and makes the film profound is the question of what is truly important in life and how we judge our actions and view the lasting legacies of ourselves and others. It’s about becoming whole. If this doesn’t sound like a fast-paced thriller of a theme, it shouldn’t. The movie is slow-paced and jumps to three different places and times (with deft enough direction that it’s not confusing). Most of it concerns the internal workings of a tired 93-year-old mind. The magic is found in the slow untangling of the truth that sometimes, when logic fails, deeper truths of worth and love grow stronger. Mr. Holmes is a poetic exploration. It asks a lot of questions and gives few answers, but the experience of the journey is a remarkably beautiful one. Cullin has said that he used the character of Holmes to explore his own close relative’s experience of aging and mind failure, and the marriage of concepts is seamless–it’s obvious the writer has intimate knowledge of the struggles of the aging mind, but Holmes never loses his essential Holmesness in the story. There’s a great deal of sadness in Mr. Holmes, but there’s also hope–hope found in the eyes of a wise child who chooses to unsentimentally carry on the legacy of an old man, and hope in the idea that even the most set-in-his-ways person can learn and grow until the very last moment of life. I’ll end on a personal note. Last year, my grandmother passed away after a long battle with dementia. Mr. Holmes reminded me of her, specifically of the strange contrast that happens when a soul begins to lose specific facts only to gain glimpses of glory. I’m thrilled to announce my participation in a new anthology project that will contain the most new Holmes stories of any collection that has ever been published. The previous record was 30; this book will contain 60 new and traditional Sherlock Holmes tales, among them my new story entitled “The Adventure of the Traveling Orchestra.” I’m joined by fellow Baker Street Babe Lyndsay Faye and many other acclaimed Holmesian authors. 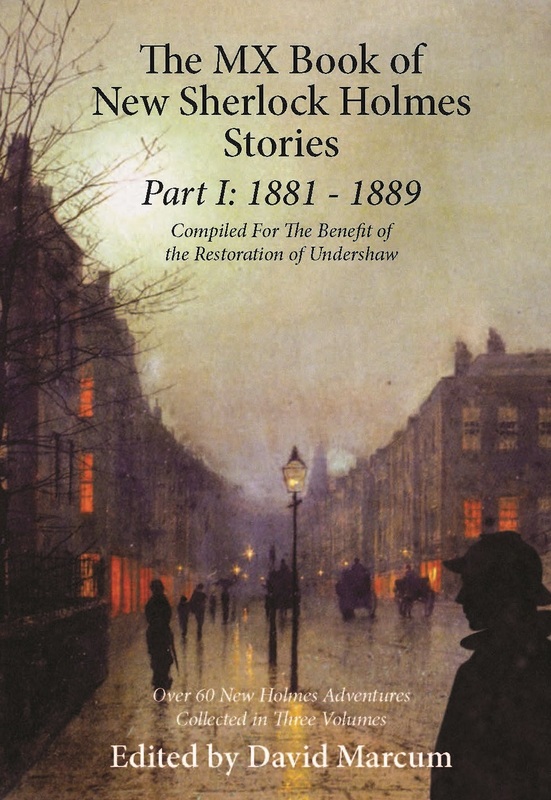 The anthology’s proceeds will go to assist the renovation of Undershaw, Sir Arthur Conan Doyle’s home. Check out this Radio Times article about the project to learn more. To my surprise and delight, Lyndsay and I are both mentioned. This past weekend brought a strange and wonderful gift to fans of Sherlock Holmes, the first clip of Sherlock’s Christmas Special, an episode set entirely in the Victorian period. Most reactions to the footage that I’ve encountered have been positive, including my own. There’s something charming about seeing the versions of Holmes, Watson, and Mrs. Hudson that we’ve come to love in the modern era suddenly swanning about in Victorian London. But there’s something weird about it, too. 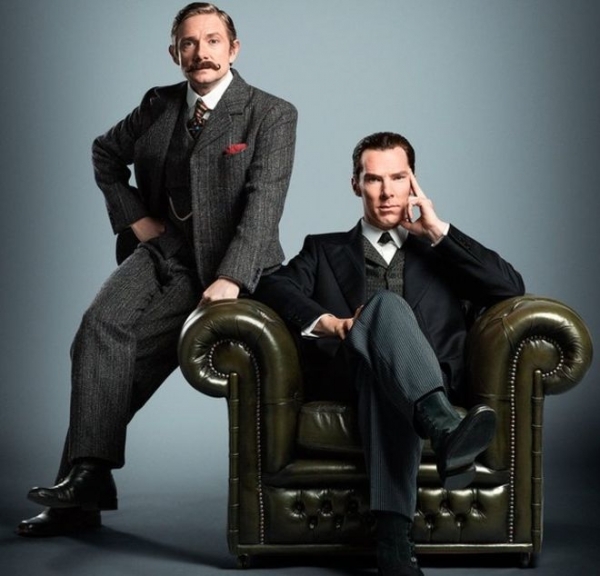 Suddenly, it’s not 2015 Sherlock Holmes who feels like the AU of a Victorian original; it’s Victorian Holmes who feels like a period AU of a modern character. I realize I’m getting very meta here, but I’m trying to describe the slightly strange feeling I had when the clip came out. For once, I think, I had the experience of fans who met Holmes first in the BBC version (or Elementary) and then went back and met the original. I’d like to say I gleaned a whole bunch of Sherlockian wisdom from this, but I really didn’t. What sticks out to me is the overarching truth that Holmes is a character universal in time and place. It really doesn’t matter where you put him; he’s still Holmes. I sometimes wonder exactly where we might be headed with him, now that the “Holmes renaissance” is giving way to something else–an era where Holmes mania is less of a fad but more of a cultural staple. I’m not very worried, though. What Benedict Cumberbatch in a deerstalker reminded me of this weekend is the fact that Holmes isn’t going anywhere, and he’s not changing into a different person. As he once said about his friend John Watson, he’s a fixed point, no matter how much the age around him changes. Oh, and I can’t wait for Christmas.